While the German Bundesliga is in its winter break, we want to take time, analyze a few teams and discuss possible tactical changes. We continue with a team which is not enjoying neither a winter break nor playing in Germany: Manchester United. The Red Devils are not in the post-Ferguson era anymore, but in the post-Moyes era. David Moyes, who works now in San Sebastian, was the successor to Sir Alex and did not succeed. The result is a year without European cup competition and with a short identity crisis. To make a drastic change, they consequently needed a tactically competent, yet stubborn manager. With the engagement of Louis van Gaal, the board have found the ideal candidate for this profile. Before taking over the job, the strident Dutch, however, had gone to the World Cup and heaved a defensive Oranje team into the semifinals. United’s US tour seemed to be promising, what already granted van Gaal his first bonus as new manager after the World Cup. Against teams like Internazionale and Real Madrid, the Dutch manager has hinted at his plans with the team, as he has seemingly implemented the 3-5-2 of the Dutch national team at the Red Devils. Still, the execution and interpretation of this formation was offensive. United played a build-up with short passing from the back three and the deep lying Ander Herrera, who had just joined them from Athletic Bilbao. Their combination play through the lines looked pleasing, the wingers were not just linear running machines, and Juan Mata was an important hub as number ten. Also United were very active with their first pressing line in a 3-4-3 or even a 3-3-4, who on the one hand pressed the opposing central defenders very aggressively, but also forced them effectively towards their isolated team mates on the wing. Planned build-up, as shown at the US tour. Albeit they had positive results at the US tour, the beginning of the regular season has been more than patchy. From the first four games United has not won a single one. With a b-string line up, they even lost 0-4 against Milton Keynes Dons in the League Cup – it was Shinji Kagawa’s last appearance in a red Manchester tricot. The first game of the season was already a huge disappointed at Old Trafford, as United lost against Gary Monk’s Swansea. 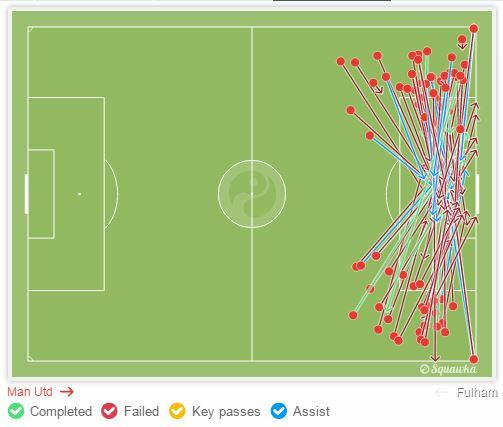 Van Gaal’s ideas of circulation in possession led to nothing. The Welsh underdog pressed in a 4-2-4, covering Herrera in their shadow and taking Mata out by man marking. United’s manager reacted immediately, and changed the formation from a 3-4-1-2 to a 4-2-3-1 after the first half time of the season. With one player less in the central defense and more focused occupation of the wings, the Red Devils were able to play more effectively through the central channels. United have not seemed ready for complicated mechanisms and processes of a three at the back system yet. Basic formations in the first half of the game vs Swansea on August 16th. 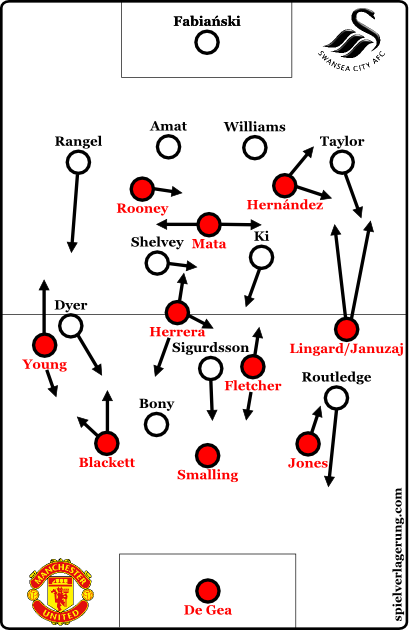 Nevertheless, Van Gaal has still used the system after the opening loss against Swansea. Their first win, however, came after they had changed their formation to a 4-3-1-2 against the Queen’s Park Rangers. Thanks to that, they have been able to press more effectively with their high press, using three players upfront. Moreover, Van Gaal has moved away from typical man orientations schemes, which has typically been seen in his three at the back systems in recent months. The success of the midfield diamond has been possible because of the central team composition, where Danny Blind has been used as pivot, where Herrera as deeper number eight has supported him, while Ángel Di María with his fluid overloading of space as half-left has taken the game by the scruff of his neck in his own manner. The players in the diamond (or “window” as Van Gaal calls it) occupy the midfielders of the opposition, which opens space for the advancing centre-back and full-backs with late runs. The circulation was promising; the attacking play was more fluid than at the beginning of the season. Formation with a midfield diamond and the possibly best line-up. This already suggests that the Red Devils have massively profited from their new signings. Especially in central midfield, where United had had massive problems in the last years, they have spent a huge amount of money. Van Gaal’s side have bought Marcos Rojo for the left-back and left centre-back position, Luke Shaw for the left wing and Falcao as additional forward. Conversely, they have ceded players like Nani, Danny Welbeck and Chicharito. Van Gaal has altered United’s squad massively, even if not every transfer happened under his aegis. From the youth players especially the two defenders Tyler Blackett and Paddy McNair have made some important appearances, while talented Adnan Januzaj has some problems right now. The biggest problems Van Gaal has kept struggling with in the first half of the season has been caused by injuries. There has been harsh critique of Van Gaal’s training methods. His fellow countryman Raymond Verheijen already talked back in August, when Luke Shaw got injured shortly after his return from a too short summer break, about the intense training which Van Gaal imposes on his players. This criticism has haunted van Gaal in his first months at the club, because also other players like Di María, for instance, have picked up muscle injuries. Is Van Gaal being premierleague-ized? Since mid-October, results have stabilized, with victories against Everton and Arsenal as highlights. Thus, United contradicted the ExpG model what often was the case in the days of Alex Ferguson, too. The Red Devils have won games in which they have used their goal-scoring chances very effectively, and benefited from De Gea’s outstanding performances on the other side of the pitch. That has been necessary, as the back line have not had a good grasp of defending the own penalty box. Those difficulties have been mainly caused by strictly man-orientated defending which Van Gaal has especially ordered in terms of back three formations. That has caused direct duels between both half-backs and opposing wingers, which is always a mismatch. A deeper positioning of Marouane Fellaini or Michael Carrick as physical midfield Libero has partial alleviated those problems. In contrary to that, the midfield diamond has been more successful defensively and offensively. As mentioned, the ball circulation has been ensured due to the individual and group tactical quality of United’s central players. However, Van Gaal has sometimes been forced to field Antonio Valencia as central midfielder due to injuries which occasioned a more linear structure. In contrast, the pressing operations have solidified. A line of three including an advanced no. 10 has pressed upfront, whereby both forwards have changed over to man orientations when the opposing full-backs had received the ball. In case the opponent had been able to play through the middle, both forwards have pressed backwards, while Mata has been backtracking to support the midfield. In terms of ball possession, United’s holding midfielders have received support by a full-back and a no. 8 with the result that isolations of the central midfielder have been prevented. Besides all those positive approaches, Van Gaal has displayed some odd and ineffective adjustments during a couple of matches which destroyed actual good structures. Throughout the first five months, moreover, we have seen some interesting role allocations. For instances, Ashley Young maintains his roster spot, as he has been retrained to a full-back and wing-back,respectively. Meanwhile, Wayne Rooney has been fielded as a central midfielder, what is a natural development in the context of the last months. The 29-year-old skipper has played even behind the no. 10 in a 3-4-1-2 formation. Van Gaal has initially used Rooney’s new role to field with Di María a strong duo in the left half-space. 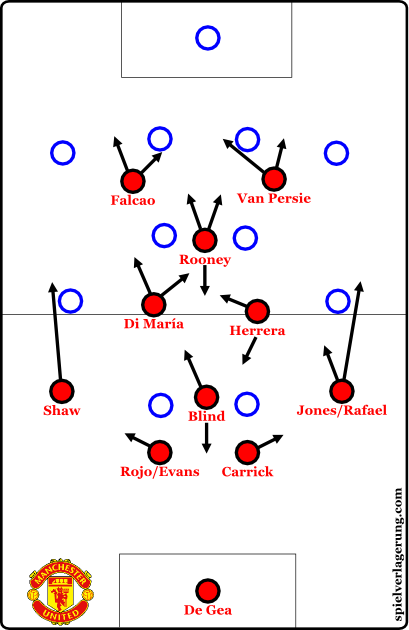 However, that duo has not been integrated well, as United have lacked a proper build-up play in the 3-4-1-2 formation. Having a lack of wide-range build-up play, with half-backs standing too centrally, and with wing-backs standing closely to the half-backs, United have had problems to generate dynamic and to capture zones in the middle third. The central midfielders have not shown constant movement to open spaces and to free from typical man-to-man coverages. 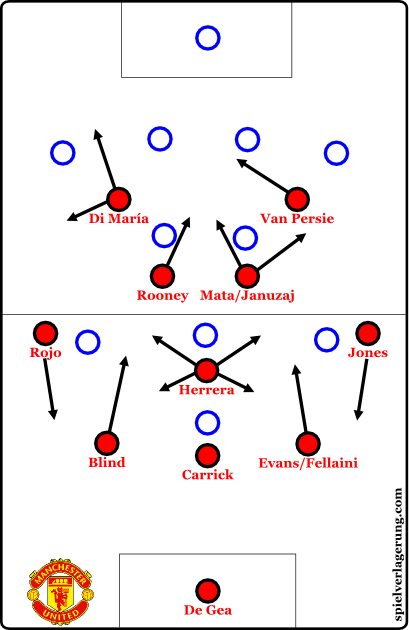 As a consequence, the Red Devils have tended to attack from wide positions by involving both wing-backs. Valencia and company have only offered static dribbles, though. That kind of wing-play as well as Fellaini’s physical role, and the lack of compactness support the conclusion that Van Gaal rather conforms to the state of the art in the Premier League than that United’s team adapts to Van Gaal’s philosophy. Is Van Gaal’s 1995 Ajax side a role model? A problem in terms of a lack of flow in the build-up play has been Herrera’s injury. Without the Basque, United has not had a connecting player in the middle, since Blind has not been able to dominate, and instead of that he has often dropped deep during the matches, hiding in the back line. Lately, United’s formation has transformed to a 3-3-2-2, as Rooney has played in an advanced position in front of Carrick. With Rooney swinging horizontally, the versatile skipper can strengthen the defence, while a ball far winger can also drop back. All together makes the United’s system more flexible. United is able to play intense pressing defensively and to block the important centre spaces. How can United reshape the build-up play? It sounds crazy. But firstly, we should assume that every key player stays fit for a while. Then United would have a luxury problem and particularly enough creative players to provide an effective ball circulation. Moreover, Van Gaal could reconsider the functions of his wingers, as they could move more inwardly. Or the Dutch forgoes wing-backs, and asks his side to play a narrow 3-1-2-1-3. This formation would seduce some Premier League teams to concentrate on wing-play even more, but would also block the middle. In addition, the Red Devils would have to focus on option-orientated coverage, protecting the halfbacks from duels against agile wingers. The first suggestion containing deep wing-backs could work, if Van Gaal would field, for instance, Blind, Rojo or Jonny Evans as half-backs. Thus, advancement into the spaces around Herrera would be possible, while the wing-backs could care for protection. At the front, Mata and Rooney as well as Falcao and Van Persie could swerve to the wings or provide connection with the midfield. As a consequence of these movements in vertical direction, United should be able to out-play antiquated Premier League sides, breaking their simple coverage. However, that possibility is already given by the use of the midfield diamond in the 4-1-2-1-2 which seems like the most promising formation. Using this system, United can capitalize on the hole between holding players and forwards in an opposing 4-4-2 formation, out-playing the opposing pivots easily. Against a typical 4-2-3-1, it depends more on a proper positional play, and consequently on a group tactical execution. Attacks through the channels are also feasible against a 4-2-3-1. Besides the system with a back three, Van Gaal should consequently improve the midfield diamond, considering his team is capable of playing more than a strictly man-orientated system, but rather can defend with the use of midfield pressing mechanisms. Only then, Van Gaal, who has already proved that he is one of the greatest managers, does not run the risk of dashing against the style of football in the Premier League. My 2 cents on why LvG is struggling at United- United aren’t a European football playing style club- even under Fergie United consistently played a 4-4-2 or a 4-4-1-1 depending on whether they are playing in Europe or domestic competition. Same continued under DM. World football moved on 4-4-2 long long ago. The Champions League defeat to Barcelona was proof. LvG has to change the entire culture at a club which isn’t as easy as it seems. The other thing being the lack of investment by Fergie for years, depriving the squad of talented players like Moura / Ribery / Benzema etc and settling for players like Valencia / young etc. Maybe somebody can help me with a question regarding the build up play in a back three. Many United Fans are blaming the back three for our slow and static build up play. Now it’s obvious that a back three featuring Rojo, Jones and Smalling is worse passingwise ON AVERAGE than a center back pairing of Rojo and Jones or Smalling. Still, shouldn’t the additional defender make things easier and actually stabelise our build up? After all, there’s always one more easy option. Maybe van Gaal is seeing the 352 as a solution to the limitations of Jones, Smalling and Evans? In general, the build up depends not only on the defenders, but also on the players in front of them. If the players in midfield are not available for passes, if they don’t move and create space, both a back three and a pair of central defenders will have problems to start the play. However, the difference with three at the back is, that the players have different angles to pass into the midfield. The line of three can occupy wide spaces and has a player in the center available. Like any other formation, the efficiency of the back three during the build up play depends on your own tactical movement as well as how the opponents move and try to destroy your game. So, it is not only a question of back three or back four, but also of how the whole team would change and how the opponents would react. There is a short article about this topic online at the Guardian. It seems that van Gaal was not feeling very comfortable when United played the 4-4-2 (diamond). Maybe the criticism is partly based on the general difference between the Dutch and English style of football. Van Gaal wants control and I think he does not like box-to-box action [as a strategy].